Transform a dull lifeless smile to a beautiful, bright white one with our convenient teeth whitening treatments. Replace missing teeth with safe, strong and secure dental implants. The natural looking and comfortable alternative. Transform your teeth with a range of beautiful veneers, and Lumineers all custom made for a natural finish. The easy, quick and affordable way to truly transform your teeth. A natural looking, fully functioning smile in just two visits- no drilling, no injections, no pain! Get the beautiful straight smile you’ve been dreaming of with a range of attractive, comfortable and affordable short term orthodontic systems. With the needs of our busy clients always in mind we are pleased to offer early, late and weekend appointments to suit you. 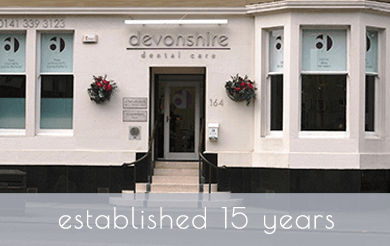 Welcome to Devonshire Dental care; a dentist in Glasgow’s West End. We have been giving our patients bright and beautiful smiles for over 10 years. You are our priority and we endeavour to do our best to give you a comfortable dental experience and a great result. We have a beautiful dental clinic in Glasgow, with the latest state of the art equipment. You can have family routine dentistry. 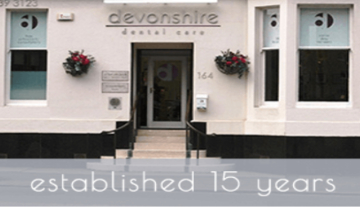 You can see any of our UK qualified dentists who have over 40 years of experience between them. You can choose from a huge range of cosmetic orthodontic braces including Damon Braces, Invisalign, Invisalign Lite, Invisalign Teen, Inman Aligner, Six Month Smiles, Simpli5 and STB Secret Smiles. You can have dental implants placed by a practitioner with vast experience. You can have Lumineers, Oralift, Snap on Smiles, Enlighten Tooth Whitening, facial cosmetic treatments and dentures. You can visit one of our two lovely hygienists. You can have evening appointments. You will have a clear estimate of costs before treatment. You can have a free cosmetic, implant or orthodontic consultations. You can have 0% finance. You can join our pay monthly Denplan scheme. You will always be treated with kindness and respect and we will always endeavour to give you the highest standards of care. Why not call Charlotte, our Practice Manager, and arrange a consultation? 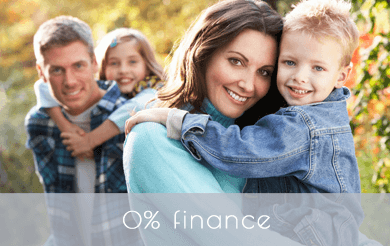 Get the treatment you want at no extra cost with 0% finance available. 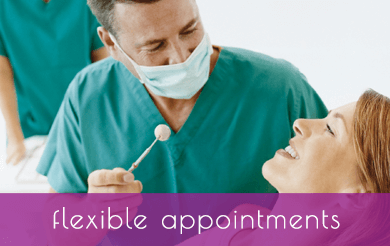 For the convenience of our busy patients we are pleased to offer late and early appointments. 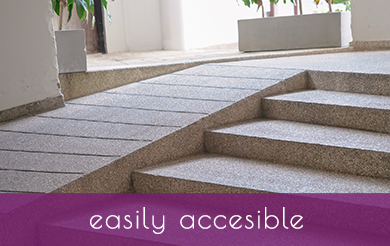 With ground floor surgeries and free parking on-site visiting us really is convenient and easy. We’ve built our reputation on high quality care and outstanding service.